Sober Sports Club, Addalaichenai captain with the trophy. 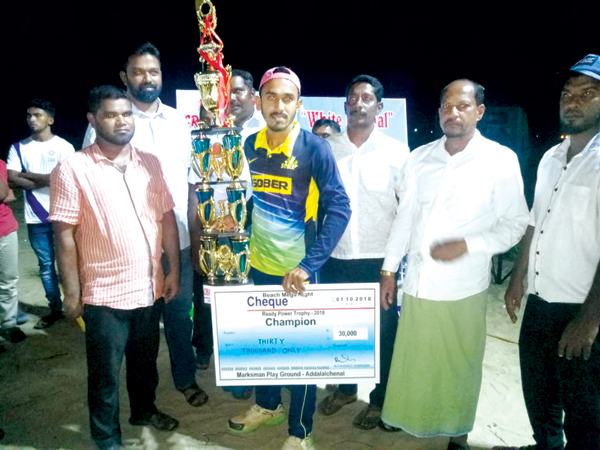 Sober Sports Club, Addalaichenai cricket team beat Marksman Sports Club cricket team, Addalaichenai in the final to emerge champions and bagged the ‘Ready Power Trophy -2018’ in the five overs flood-lit Beach Mega Night cricket tournament at the Marksman Grounds, Addalaichenai recently. Addalaichenai Marksman Sports Club former President A.G.Rifai organized the tournament. The tournament saw a record number of fifty prominent teams from the Ampara district participating. Man of the match award was secured by Nikzy Ahamed and Man of the series award was secured by Sifan of Sober SC. The best bowler was R.Nowshad of Sober SC. The winners Sober SC team was awarded a shield with Rs.30,000 cash prize by the guests and the runner up Marksman SC team was presented a trophy and Rs.15,000 cash prize. Ready Power Construction Managing Director K.Ramees, Consumer Affairs Authority Executive Director and Addalaichenai Pradeshiya Sabha Ex-Chairman M.A.Anzil and Coastal Conservation Department Regional Co-ordinator M.I.M.Jazoor participated as the guests and awarded the trophy to winning team and players.